VANCOUVER — After transitioning earlier this year from Slavic radio programming to a new genre, local radio station Outlaw Country 102.5 FM offers Clark County country fans a new station and unique take on the country radio genre. According to David Stepanyuk, station manager for the station KIEV-LP Camas, the radio station began several years ago as a broadcast service for the area’s Slavic community, and initially broadcast on 102.7 FM. Stepanyuk said that the station was forced off of that band width by the more powerful KYTE-FM, which forced the station to operate on a signal that did not have as clear a broadcast. Being forced off of the original radio wavelength helped initiate changes at KIEV-LP Camas. Stepanyuk said that the station was facing stiff competition for the Slavic radio audience, and could not compete with larger stations in Oregon. It began to lose underwriters and sponsors, and he said that a change needed to be made if the low power FM (LPFM) station was to stay on the air. When looking at options to stay on the air, Stepanyuk said that many residents in the Clark County area love country music, and that seemed like a potential avenue to redirect the radio station. By focusing on segments of the country music genre not offered by other local country stations, Stepanyuk said that Outlaw Country 102.5 FM, as the station is now called, can offer community based radio as a service to the local community and therefore carve out a niche for itself in the local radio market. Local radio broadcaster Gerald Gaule, who owns and operates the local American Senior Radio Network, works as a volunteer and host of the Country Connections radio show on Outlaw Country 102.5 FM. He said that the station focuses primarily on older country music, from the 1950s and later, and features artists such as Merle Haggard, Johnny Cash, Buck Owens and Hank Williams. Gaule said that the station is not limited to a set time period or list of musicians. Rather, it is designed to showcase the roots of country music, and provide a different experience from larger stations in Portland that play only current country music. To that end, in addition to “outlaw country” artists, the station also features a country gospel session on Sunday mornings and explores even older, pre-1950s country music on Sunday afternoons. The decision to focus on older classic country artists allows the station to dig into the roots of the country music genre, Gaule said, which is something even other “classic” country stations do not do very often. He said that many older listeners missed the country music that they listened to growing up, and that there has been much positive feedback from loyal listeners to the radio station on its genre selection. Outlaw Country 102.5 FM operates on a not for profit basis and does not feature advertising. It is completely supported by listeners as well as the station owners, Stepanyuk’s parents. By operating as a not for profit venture, the station is designed to be a community outlet and serve the local community. However, Outlaw Country 102.5 FM continues to face struggles in staying on the air and competing with other radio stations. Stepanyuk expressed bitterness at the FCC’s handling of the station getting forced off of its original broadcast channel. He said that the FCC has a history of siding with high powered and corporate radio stations at the expense of local LPFM stations, and his station’s having to move frequency is an example. Currently, Stepanyuk said that LPFM stations operate at lower power and have more restrictions placed on them that limit their reach and influence. Stepanyuk explained that an act of Congress during the Obama administration helped many LPFM stations form and be recognized by the FCC. However, he said that further government action needs to be taken to help the stations. “LPFMs need to be able to be protected,” Stepanyuk said, and noted that FCC requirements that limit them to 100 watt power output mean that LPFMs can be displaced by higher powered stations and interference. Gaule said that the difference between the efforts of LPFM stations such as Outlaw Country 102.5 FM and larger corporate radio stations “is in the community.” According to Gaule, the station exists to serve the community and its listeners. Outlaw Country 102.5 FM is still very much in its infancy as a radio station. Stepanyuk said that in the future, they hope to find a better location for the transmitter, as the current transmitter provides only spotty and unclear reception. He said that ironically some of the clearest listening for the radio station is in Gresham. They also want to work to get the FCC to loosen some regulations on LPFM stations that would allow them to use a higher power broadcast output, as well as lift restrictions limiting where and on what type of structure they can place their antenna. Stepanyuk said that in the future he wants to appeal to Senator Maria Cantwell of Washington to work on legislation that would protect LPFMs and bring them to a better position with regards to larger stations in the eyes of the FCC. 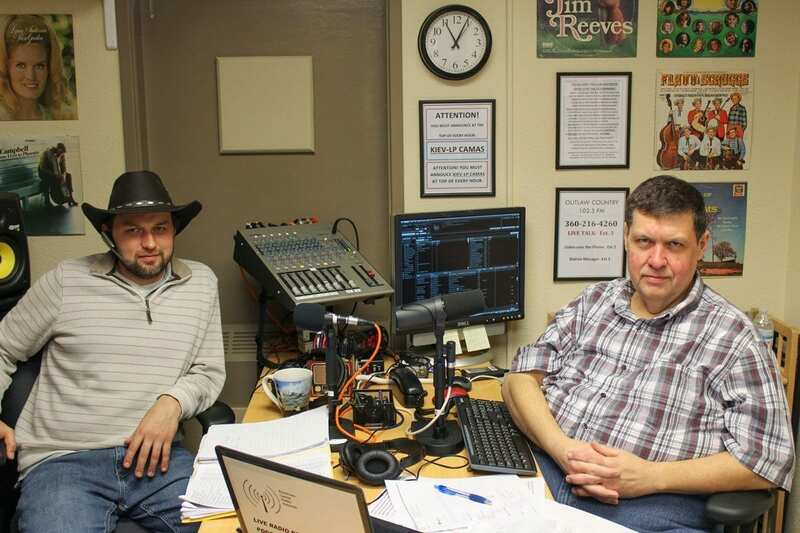 At the heart of the operation, Stepanyuk and Gaule both said that they are committed to community radio, and that focusing on classic country music is a unique way to do that. “It’s a part of America,” Stepanyuk said, and there is such a variety of country music that can be played to make them unique. Stepanyuk said that the station is always looking for support and volunteers to expand its operations. “Any help is big help,” he explained. More information about the station, as well as online broadcasting, can be found at https://www.outlawcountry.net/. You can also visit their Facebook page at Outlaw Country Radio 102.5 FM and the Country Connections Show Facebook page. “We’re here for the people,” Stepanyuk said.